Coral are one of the big 3 bookmakers in the United Kingdom. 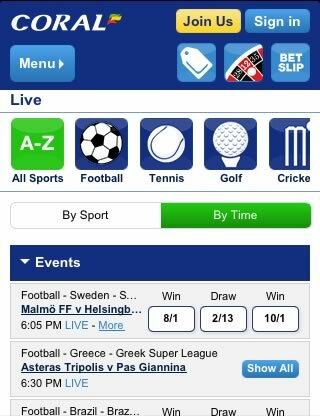 They have developed dedicated betting apps for Android and iOS tablets and phones. Their mobile site is compatible with both Blackberry and Nokia. Available on iPhone, iPad, Windows, Android, Nokia, Blackberry & more. Get a £50 FREE BET with Coral Mobile when you place your first wager. Watch every greyhound and horse race from the UK on Apple iOS devices. Bet on thousands of in-play markets, including football, tennis, golf and cricket. 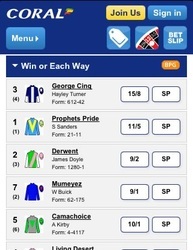 Coral Mobile guarantee that you will receive the best price on ALL U.K. races. The Gala Coral group is the UK’s third largest bookmaker with over 1,700 betting offices to its name. As well as a significant betting and gaming presence in a number of countries, the group now has a strong online presence in the form of the Coral sports and gaming site and mobile apps. Available free for iPhone, iPod, iPad and Android as well as selected Nokia and Blackberry devices, the app has been praised for its usability and features. Coral Mobile has an extensive range of markets on offer, a number of nice features and attractive signing up promotions. One of the main features available to Coral users is the availability of in-play betting on a wide range of sports and markets. 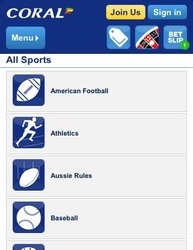 The app boasts live betting on thousands of events from staples such as football to more obscure events and competitions as well as American sports and markets. Perhaps most impressive, however, is the availability of live streaming of UK horse and greyhound races. A dedicated Live Racing tab displays forthcoming races where live streaming is available. 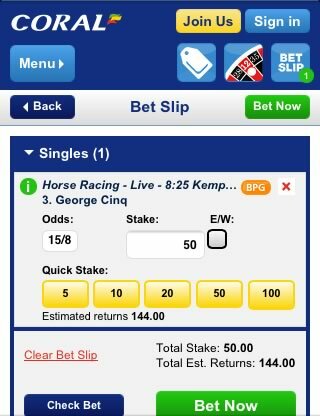 Simply place a bet of £1 or more on the race and it can be viewed on your mobile or tablet device starting from typically between 3-5 minutes before the beginning of the race. A nice little extra feature is a specific racing results section where recent results can be found at the touch of a button and the results from specific meetings can be searched for. A further feature allows customers to set how they view odds formats for those more inclined to the decimal than the fractional. 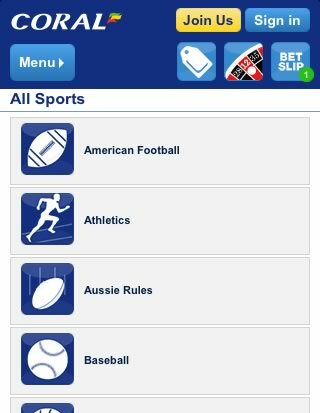 In common with some other mobile sports betting apps, the mobile site and apps are actually an improvement on the look of the main site and have a much better appearance and feel on the smaller screen than the big. The simplified app and mobile versions cut away extraneous tabs and information and focus the attention on betting on the move. The layout of the app and navigation around it are excellent with the sport and gaming sections accessible at the touch of a button. Beneath these are tabs for speedy access to various account features and miscellaneous extras. Tabs across the top of the screen allow quick viewing of current promotions, along with access to the online casino. 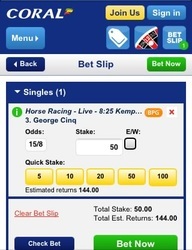 A third tab allows customers to review their betting slip. Within the sports section, the format is similarly straightforward and well organised with feature events and matches appearing in the centre of the screen and the main sports tabs above. 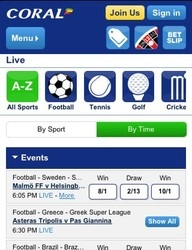 The ‘Live’ tab shows in-play betting options at the click of a button. All in all, the app is clear, looks good and provides user-friendly and logical navigation around it. Coral offers a number of attractive promotional schemes and bonuses that vary from time to time. 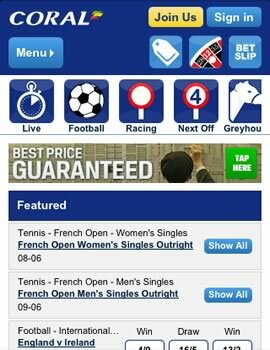 Currently on offer is a free bet up to £/Euro 50 for all new customers signing up online or via mobile device. All that is required is the placement of an initial deposit and qualifying bet and Coral will match the amount of your first bet with a free bet token of equivalent value. The offer must be used within 28 days of account opening and within 7 days of placing the qualifying bet. The free bet token must be used in full and is non-refundable. Throughout the year Coral also runs various unique competitions and offers on specific events that punters can take advantage of. At the time of writing, for example, a ‘Second to Tiger Woods’ offer is currently available on the Memorial Tournament in Ohio. Woods has won this event on five previous occasions and is likely therefore to be one of the favourites again this year. Simply place a pre-tournament outright win or each way single bet and if your player is pipped to the post by Woods and comes second then the win part of your stake will be refunded in the form of a free bet up to £/Euro 50. 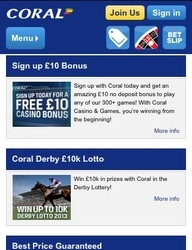 From time to time Coral also runs a number of competitions with no bets required. Currently on offer is the chance to win up to £10k in prizes on the Epsom Derby. Entrance to the competition is via text message with participants receiving random lucky numbers. If the numbers match the sequence the horses finish in you are eligible to win the prizes on offer. Also on offer at the moment is the chance to win a Mini Cooper and a number of mini Ipads and breaks. Participation ranges from merely texting your details to Coral to wagering £10 in each of the five different site sections (Sports, Casino, Poker, Games and Bingo) in a week to also receive a bundle of promotional bets and bonuses. For those interested in the casino and gaming options, a casino welcome offer gives new players a choice of introductory bonuses. Either buy in for £10 and receive a £50 casino bonus (play with £60) or buy in for £25 and receive a £25 table game bonus (play with £50). Again, this offer is only available to new customers signing up online or via mobile device. In addition, sign up and register a debit or credit card and receive a no deposit required free £10 bonus redeemable on over 300 games in the casino and games section. As you would expect from such a large and well established sport and gaming group, most sports markets are catered for from Aussie Rules football to UFC. A number of non-sporting wagers can also be had from politics to the weather. Virtual events and markets are also provided. Coral offer a best price guarantee on all UK and Ireland race fixtures. Any punter taking an Early Price or Board Price where the SP is better will be paid out at the greater odds. Significantly, the promise only applies to bets placed via the web or mobile on the day of the event. Check other terms and conditions if unsure of applicability. Accounts are managed via the app and there is a dedicated section on the main screen for account issues. Your account and bets can be easily reviewed via the app and a help section deals with frequently asked questions and support. Contact with customer services is via phone or email. The app is well set out and user friendly with its simple design and navigation making it easy to use. 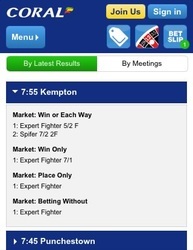 Sports markets are clearly organised making betting on the move easy. 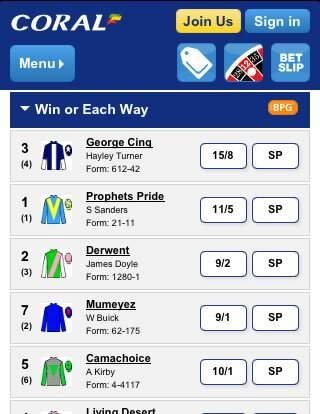 A best odds price guarantee and live streaming of horse and greyhound racing makes the app a particularly attractive one to UK and Ireland race fans and the array of offers and introductory promotions are a nice bonus. 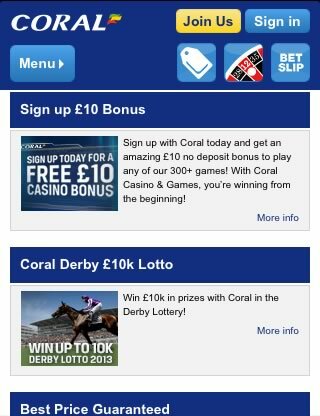 Coral Mobile leads many other similar apps and remains a good option for those wanting to bet on the move.